This was first of a couple of American High School Theatre productions I’m planning to see over the festival. I’m particularly keen to see this show as a number of the songs are listed in the LCM Musical Theatre Exam suggested repertoire. 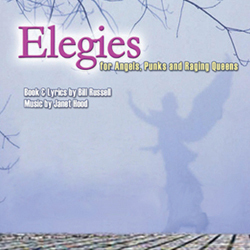 Elegies for Angels, Punks and Raging Queens is not a light hearted show. It’s a show about AIDS, and it documents the stories of various victims of the disease. This isn’t a show with a plot – it bears more relation to a cabaret than even a “concept musical”. Songs break up a series of monologues telling the tale of AIDS victims. We start with the “classic” victims – the gay man, the prostitute. Throughout the show, we also see victims of blood transfusions, and maternal transmissions. What is most striking about this show is the lyrical nature of the monologues. They have an almost Shakespearian quality with very rhythmic language, and a smattering of rhymes. I’d be keen to see a printed copy of the book just to know how the speeches were laid out on the page. In terms of performance, the style of the language made the speeches just stylised enough to stop this show just being a misery-fest which would cause the audience to shut down rather than engage with the issues. The songs were catchy, and emotive. All of them work as stand-alone songs, although “My Brother Lives in San Francisco” is particularly closely related to the preceeding monologue. I liked some of the songs more than others, but all of them worked really well to lift the show without making light of a serious topic. I don’t know if the staging of this production was new, or similar to the original version, but the use of projected images was excellent and the dancers were fantastic. The cast of this production were a mixed bag. Some of them were excellent. I particularly loved the group performing “My Brother Lived in San Francisco” – the song almost moved me to tears. Overall, the singers were good, but these are big songs, and I felt the show probably needed more mature voices to really bring out the full potential of many of the songs, such as the rootsy and gospel-esque “Angels, Punks and Raging Queens”. The limited band (just a piano) was also not enough to carry some of the more upbeat numbers such as “Celebrate”. There was also a very variable quality in the acting. This was a very young cast, and none of them would be old enough to remember the AIDS crisis (in fact, I suspect the show itself is older than most of the cast). The show is full of difficult and complicated emotions, and although the actors all did admirably, many of them were unable to capture the full depth of the speeches. An older cast would likely have been able to tackle this work more convincingly. Some performers were excellent, though tellingly those were the ones given more light-hearted sections. The finale number was very well staged, with the cast coming into the audience and giving everyone red ribbons, and shaking all our hands to thank us for supporting those who live with AIDS. A retiring collection was made for AIDS charities, and I believe they were able to give at least £4500 from the donations and ticket sale profits. I loved the show itself, and I am keen to get hold of what music and script that I can as it’s a fantastic resource. However, I’m not sure the cast were really able to tackle the full depth and complexity of the show – something that is highlighted by the fact that the dancers were the best performers by far. However, I wish I could have been a fly on the wall in 1989 and 1990 when this show was first performed in the US. With a full band, and professional actors, it must have been heart-wrenching and challenging. I hope that this show and its songs continue to raise awareness of AIDS long into the future. We may be able to manage the condition in the Western world, but people still, ultimately, die of AIDS. For more information about AIDS and support for anyone living with AIDS and HIV, or caring for someone, contact Waverley Care. This performance was also supporting Broadway Cares/Equity Fights AIDS, who work with the theatre community in the US to help raise awareness and provide support. This entry was posted in Musicals, Reviews and tagged 4 stars, fringe 2013, musicals, reviews on 12th August 2013 by .